Ready for a nail polish indie? It has been awhile hasn’t it! 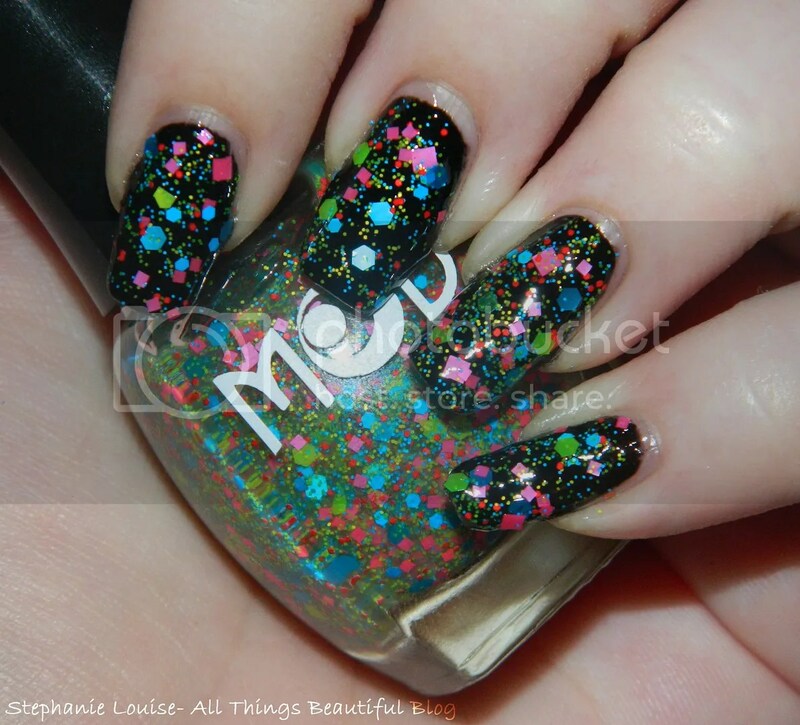 This was the first polish I ever purchased from Mod Lacquer & I’m quite happy that I get to share it with you tonight. 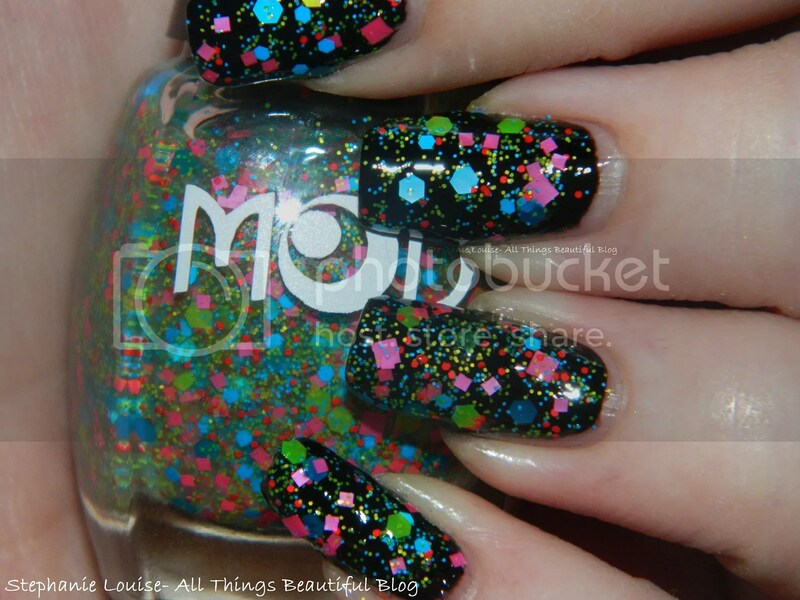 I don’t think I need to explain what drew me to this polish…I just love it. This is bright summer lights in a bottle! 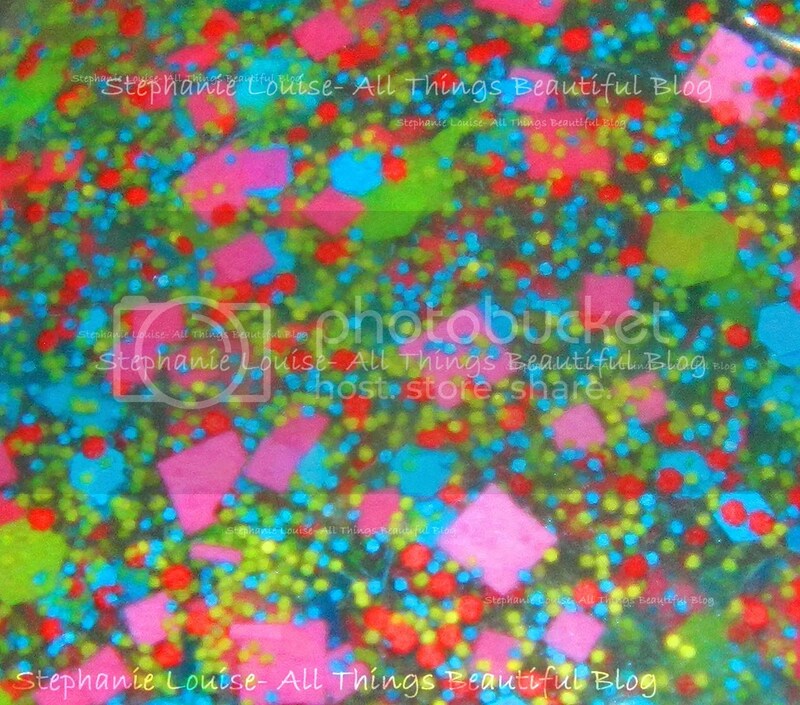 Mod Lacquer Technicolor Noise- Micro hexes in bright blue, lime green, extra small hexes in tomato red, then small to medium lime green, bright blue, & hot pink hexes suspended in a clear base. Top coat is Sally Hansen Insta-Dri & the black base is Wet n Wild Black Creme. The first thing I want to say is wow. It is gorgeous & I seriously took like 50 photos. Application was a breeze. This is 2 coats over black with a top coat. 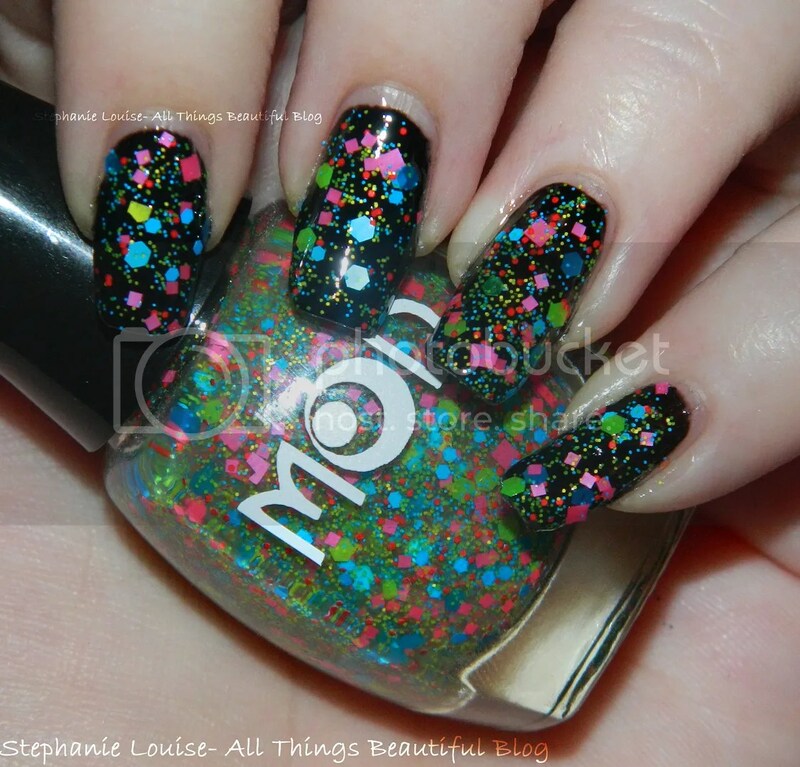 I did a few light sponging here & there for perfect glitter placement. I’ve had this shade for almost a month & it hasn’t settled. I am so impressed with this base. This glitter combination is absolute perfection & the red really makes it pop. I would’ve never thought to add it myself! The bottle shape & brush are also quite nice.You can see other shades I hauled in this post along with some Shimmer Polishes. I am wowed. I am more than happy. & I had a really hard time taking it off not because it is a glitter but because I could wear it for ages. 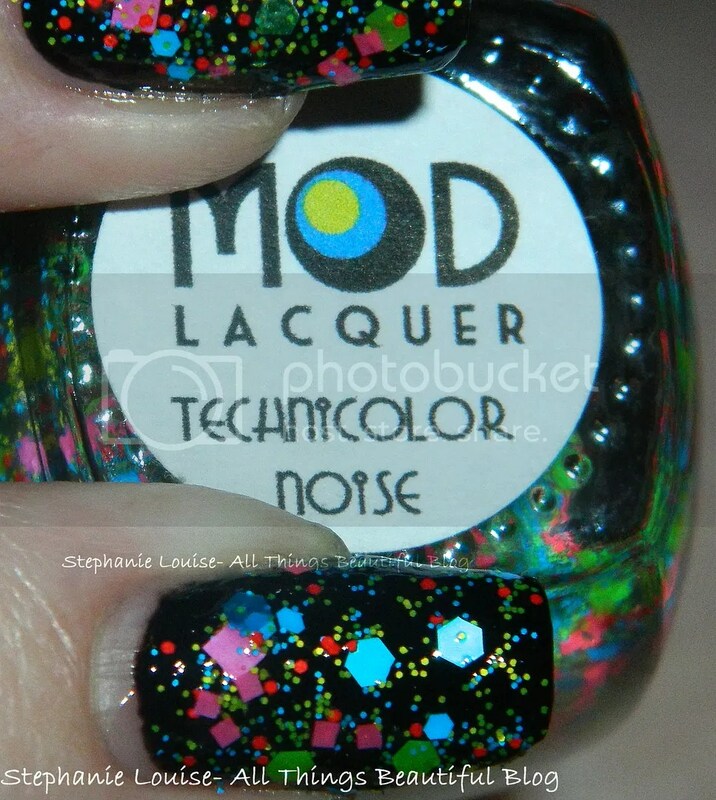 You can purchase this shade & others from the Mod Lacquer Etsy shop. I bought a full size but she also has minis available. She also has a new summer collection which I’d really love to get my claws on! There are also some stunning shimmers although I am just head over heels for the glitters.